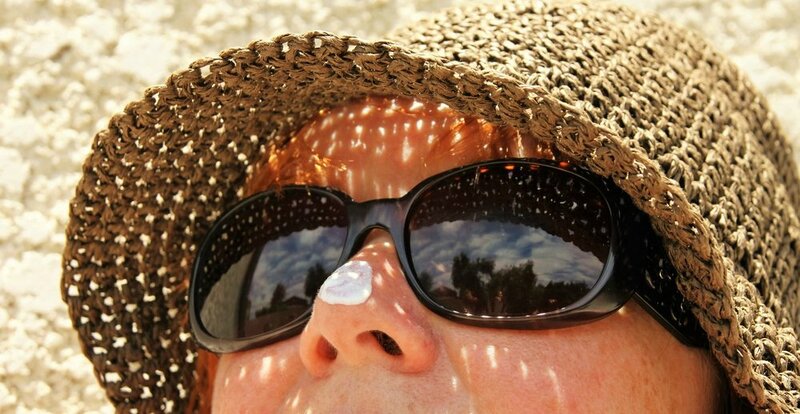 Malignant melanoma, squamous cell cancer, and basal cell cancer are skin cancers associated with ultraviolet (UV) radiation. Rates are much higher in places where there is a lot of sunshine year round. In our San Francisco Bay Area culture of swim team, soccer, golf, and tennis we have a very high rate of sun exposure and hence more skin cancers. Skin cancers (skin neoplasms) are named after the type of skin cell from which they arise. Basal cell cancer originates from the lowest layer of the epidermis, and is the most common but least dangerous skin cancer. Squamous cell cancer originates from the middle layer, and is less common but more likely to spread and, if untreated, become fatal. Melanoma, which originates in the pigment-producing cells (melanocytes), is the least common, but most aggressive, most likely to spread and, if untreated, become fatal. Surgery for melanoma includes removal of the melanoma lesion from the skin along a margin with of normal surrounding tissue. Some patients may require more extensive surgery to evaluate the lymph nodes and determine the stage of disease. This procedure is called sentinel lymph node biopsy and may be indicated based on the thickness of melanoma and certain pathologic features. Adjuvant therapy refers to the use of chemotherapy, targeted therapy, immunotherapy or radiotherapy in addition to surgical resection in the treatment of cancer. The goal of adjuvant therapy is to improve the survival and control the cancer in patients with stage III and IV disease. Chemotherapy is the term used for drugs that kill cancer cells. In fact, these days, the term usually includes biologic or immunologic agents, also called targeted agents. In general, chemotherapy functions by interfering with a cells ability to reproduce, often by disrupting DNA replication. The side effects are noted because the drugs are active against both abnormal (malignant) cells and normal tissue. Targeted therapy and immunotherapy have shown to improve the outcomes for patients with advanced melanoma. These treatments take advantage of certain genetic differences in the tumor with the goal of destroying cancer cells while leaving normal cells intact or by activating the person’s immune system to destroy melanoma cells in the body. Targeted agents act on specific proteins which are on the malignant cells, but not on normal cells; often, this reduces the incidence of serious side effects. In many cancers, chemotherapy has markedly increased cure rates, length of life, and our palliative ability (relief or prevention of symptoms caused by cancer). In the treatment of cancer, Radiation Oncology uses sophisticated technology to aim high energy X-rays directly at the site of disease. Administering radiation therapy requires close-knit cooperation amongst an entire team of healthcare professionals. As part of our mission to provide compassionate, first-class, fully integrated cancer care under one roof, we help coordinate multidisciplinary care plans with surgical and medical oncologists, dermatologists, and the primary care physician. Our cutting-edge treatment delivery is made possible through the use of two new Elekta Synergy linear accelerators which are equipped with cone-beam CT and respiratory gating technology. Our state of the art facility is also equipped with a CT/ PET simulator for sophisticated treatment planning. To demonstrate our commitment to technical excellence, we offer image-guided radiation therapy (IGRT), intensity modulated radiation therapy (IMRT), three-dimensional conformal radiation therapy, and stereotactic radiosurgery. We are proud of our high quality assurance standards that help us deliver the safest and most effective reproducible treatments possible. Not only do we use the most advanced proven technology, but we also carefully customize treatment plans to optimize benefit for each patient by more effectively targeting tumors, while sparing healthy tissue and minimizing side effects.